Product categories of VSI Impact Crusher, we are specialized manufacturers from China, Vsi Impact Crusher, Vsi Crusher suppliers/factory, wholesale high-quality products of Vsi Sand Crusher R & D and manufacturing, we have the perfect after-sales service and technical support. Look forward to your cooperation! Zoneding VSI series of Vertical Shaft Impact Crusher (or Sand Making Machine) is a highly efficient crushing machine which introduces [stone to stone" and "stone to iron" crushing principle from American Bamac company. 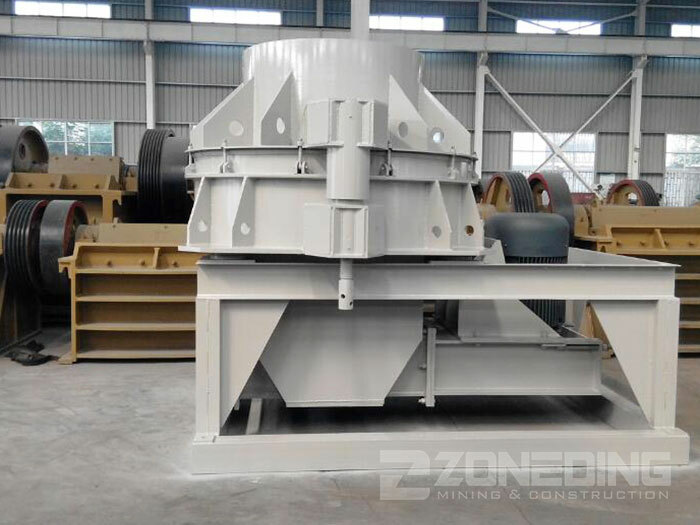 Combining domestic actual sand making condition, this crusher is designed as a highly efficient crushing machine of domestic and international standard. This crusher is widely used to crush various rocks, grinding materials, refractory, clinker, quartz, iron ore, concrete aggregate, etc. Vsi Crusher is the ideal equipment to make construction sand. 1. Unique structure and stable operation. 2. Lower energy consumption, larger capacity and crushing ratio. 3. Perfect cubic product size, bulk density is big. 4. Material will form one protective layer during production, protect the crusher body, and make it more durable. 5. Less spare parts. Spare parts are made of special hard material, has longer life and easy to change.